I absolutely do not write this in criticism, I am purely curious, and to be honest, a bit confused. I have been seeing more and more book covers include the text “A Novel”. Why? What is it for? What is its purpose? Is this an artistic flair that’s catching on? Is it because the cover art is ambiguous as a work of fiction, so it is labelled with “A Novel” for clarity? Is it the counter-point to a novel in a collective including the book-series name (the So-and-So Trilogy, or the Whatsit Chronicles, and so on)? I don’t think there’s anything wrong with the act, though from a personal standpoint, it’s a superfluous line of text on a cover, and I prefer the least amount of text necessary to be on a front cover. But that’s me. The traditional industry likes to include blurbs (as in, a snippet of a quote from someone influential) on the front, or identifying information: “Award winning author of This Other Book”, or “International Best Seller”. Frankly, I have never cared if an author is an international best seller, or has won awards (except in conversation when I’m trying to drive home the point that an author is kind of a big deal, even though the person I’m talking to has never heard of the writer before). To put that kind of text on a cover just irritates me; it’s wasting space, and often ruins an otherwise well-balanced layout. But that’s kind of off the subject. I can’t see a reason to have “A Novel” placed right up there on the front. Why did the designer make this obvious statement? The description will indicate that it’s a fictitious narrative. I’ve never bought a novel without reading the description/back cover, so it’s not as though I will misunderstand the book is an invented (or exaggerated) story by the time I’m considering reading it. Also, I’m sure it’s happened, but I don’t recall seeing any which say “A Novella”, or “A Novelette”. If anyone has insights, I’d love to know. I may never view “A Novel” as something entirely valid to include, and I probably won’t pass any particular judgement on the book if the label is present, but I certainly notice it. Every time. Thus, I am curious. It’s funny, I have noticed this before as well. Sometimes I see it on a book where the title may be vague and my lead the reader to assume it is non fiction, for example, The Arsonist’s Guide to Writers’ Homes in New England (which included the :A Novel…but I mean, if this was a real non fiction book, that would be a bit concerning actually). But I think it is purely because the people marketing the book might feel it adds a bit of class to it. It does always seem to be standalone novels that include it, and also it mostly seems to be novels that fit into the general literature shelves in bookstores – not genre fiction. But I agree, on the whole – writing “A Novel” seems to be somewhat pointless in most cases. Yeah, it’s not a super well-known novel that one. I saw it in a bookshop, and laughed so much at the title I bought it. I was pleasantly surprised to find it was both a good read, and also quite accurately described by its title. I’ve noticed that too. It seems to happen in literary fiction the most. A friend of mine said that she figured it had to do with the fact that with ebooks, unless the length is listed there’s no simple way to know, especially on Amazon. And novellas have been sort of popular. So “a novel” is supposed to tell readers they’re getting the real thing. I dunno, that’s the only explanation I’ve had so far. Perhaps the length is something which spurs a current e-book usage, but when Jonathan Strange & Mr Norrell came out in 2004 (and is an absolutely atrociously huge novel; fun to read, but it’s a genuine brick! ), I doubt it needed the classification. 😉 So maybe it started in one place, and others have picked it up for their own entirely new reasons! I do believe the correct term for your 300K word book is “supernovel”, since surely it is so massive that it will make the reader’s brain explode before collapsing into a black hole. I always notice it too. 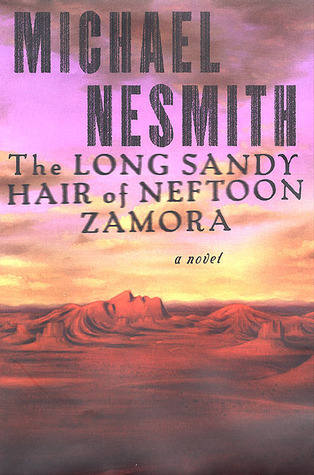 “A novel” appears on the cover of Mike Nesmith’s ‘The Long Sandy Hair of Neftoon Zamora’ probably as a sales point so that people who bought it wouldn’t be confused as to why they were getting a book & not a record (though there’s a lot of music mentioned in the story, it was Nez’s first work not to include any actual music)…but then again, most people who followed Nez closely enough in the 90s to know the book existed also figured out that it wasn’t an album. The cover of that book (http://photo.goodreads.com/books/1311985639l/1680301.jpg ) is quite lovely, even with the superfluous qualifier, but still, it’s distracting. See, in that instance especially, the text is all floating down in the empty space of the image, so it’s especially problematic for me. I don’t mind the practice all on its own merits, but at least they could make sure they make it look nice in the process! Indeed, one should be able to figure out through the context of script-format that they are reading a play, and not have to announce it as such. Personally, I plan on publishing all sorts of lengths of things, and in alternating order – story collections, novels, novellas (and yes, I have seen “a novella” or “a short story” after a title as well). It didn’t used to be that many short stories or novellas were even published at all (high-risk/low profit format), but with the rise of ebooks, now they can be published easily, and a lot of writers are taking to them. So it’s just a quick and bold way to let the reader know for sure what they’re getting, so they can’t say they didn’t know. Because yes, people WILL buy a book (especially if it’s on sale cheap or free and has a nice cover, or if it’s by an author they already know) without reading even a blurb, and then they’ll come back and review it badly because it was “too short”. Well duh, they bought a novella, it was supposed to be short, right? lol! But they don’t care, and a bad review is a bad review all the same. Human race like everything “Labeled” or they get confused. Its also thier for convience and time management. As we are so busy in our worlds, if we glance down see the book has “Novel” written in the title a person will pick it up no confusion its a novel. If something is not clearly labelled people then ask stupid questions, full well knowing the answer. As they need absolute clarity what they are getting. (Working in retail I come across this everyday) People feel lost and scared when there is no labels or instructions. Its like I never understand alot of this in life. Like something as as black white as your pointing out I shake my head at silmilar things…Like a packet of peanuts has written in the warnings “Contains nuts” Umm Yes your buying nuts in the first place!!! The retail market treats all potentional buyers as “Blonde” (Just using this as a term of referral, blondes please don’t take offence) and the customers have become reliant and custom to the obvious written on everything. I can’t help agreeing there, Helen! It does feel a lot like the consumer is growing too accustomed to everything being spelled out for them. As Laura mentioned above, people somehow feel entitled to giving a BAD review of a story because they didn’t comprehend it was a shorter tale! How many people believe they should blame others when their own understanding was lacking is a little bit sad, really. Yes, I’ve noticed this trend, too. The only times when I could see some practical use for it is when the author has previously written memoir or some other form of nonfiction. (I follow a couple writers who have done this.) It does clarify the distinction, up front, between this and their other works. I wonder if there should just be a checklist for online sales which shares that sort of information. We have genre/content tags. Why not add in length as well? Novel, this many words, this many (equivalent) pages. Not only are folks writing monstrous lengths, they’re hiding it by printing in larger dimensions! I will not be surprised to come across a novel in a full A4 page size one of these days. I have nothing intelligent to add here; it’s pretty much all been covered in these excellent comments. Other than that this practice has been around for many years, possibly even decades. I can recall seeing this years ago and wondering about it. I also recall it being around ages ago, so it caught my eye when recent releases were picking it back up! Call me dumb, but I’ve actually appreciated “a Novel” added into a title. I read a lot of biblical fiction, and it helps my search on amazon to identify when a book is fiction, and when it is an actual biography of, say, a person who lived during biblical times. I appreciate others’ comments on this, too. I didn’t realize there were other reasons for including the phrase. Interesting! I think it’s completely fair when you have a good reason for it, so I can understand why it would be helpful to you! If someone wrote an entirely fictional account of any historical figure, it would almost be for the best if they were front and centre with declaring it “A Novel”. So although writers now have likely adopted the practice for various reason (prestige, clarity, tradition, formatting, etc. ), it at least started out as a way for this new-fangled “novel” concept to establish itself among readers. Pretty cool, huh? Well, this sort of thing will always inherently spring from assumed meaning. If a person aspires to be as other authors, they will no doubt imitate what they consider to be “authorly” traits in their work. Call it high-brow or traditional or snobbery, or don’t call it anything, but humans will senselessly ritualize just about any activity until it is entirely devoid of purpose beyond the act of fulfilling tradition..